After four disappointing seasons, Scott Pioli has been fired from his position as general manager of the Kansas City Chiefs. The move comes with the expected news that the Chiefs will hire former Eagles head coach Andy Reid, and that Reid will be choosing a GM. Pioli was a massive flop for the Chiefs, who thought they were getting a top-flight GM when they acquired him from the Patriots. In New England, Pioli was a five-time NFL Executive of the Year and served as the top front-office assistant to head coach and general manager Bill Belickick. During Pioli’s tenure in Kansas City, the Chiefs compiled a 23-41 record. Both of his coaching hires – Todd Haley and Romeo Crennel – didn’t pan out, as Pioli famously feuded with Haley during the coach’s final season. Pioli’s style also frustrated coaches and players, as he was accused of bugging phones in team offices and other secretive behaviors. 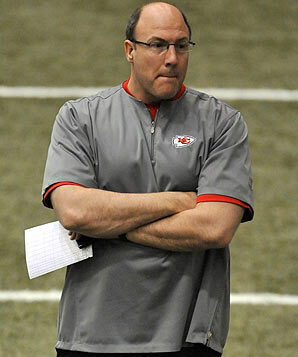 It was Pioli’s personnel decisions that were the biggest red flag during his tenure in Kansas City. Pioli made several ill-fated moves, most notably trading a second-round pick to the New England for quarterback Matt Cassel and then signing him to a $63 million contract. Pioli also made several other puzzling moves – he traded Kansas City icon Tony Gonzalez to Atlanta for a second-round pick that he used on Javier Arenas and signed several veterans such as Stanford Rout that were disasters. Pioli also drafted extremely poorly, and as a result, the team found itself with paper-thin depth the past couple of seasons. It was obvious that Pioli had to go, and the Chiefs should have cut ties with the GM much earlier. Kansas City needs to find someone who can build the team through the draft and create a roster with depth at every position. Hopefully, the GM that Reid brings in will be able to get things turned around.